Remote locations often require a keen look at energy, given high costs to deliver each kW. Martha’s Vineyard is an island off Cape Cod, Massachusetts, that is something of a time capsule of cultural memory. Like its neighboring island, Nantucket, these places have preserved the look of their habitat by restricting certain building materials and typical fast-food franchises and overbearing shop signs. The control with the committee approval process is strict to say the least. 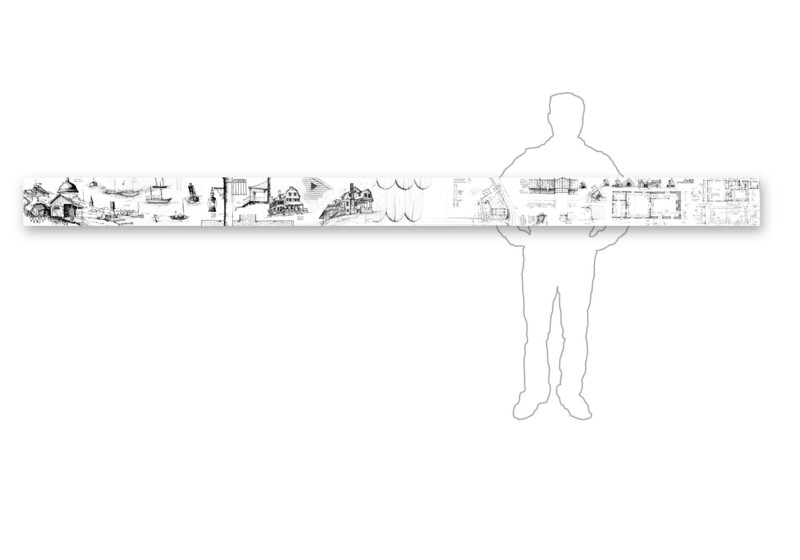 The intended homogeneity is extreme and potentially stifles an inventive sprit of progress. A beach-side house, with a solarium, facing the water also has an outside shower. An outside shower is the best place to remove the day’s sand and think about the evening’s activity. The feel of wood grain under foot is more pleasant than a slick tub or tile, and hardwood versus softwood helps reduce splinters. 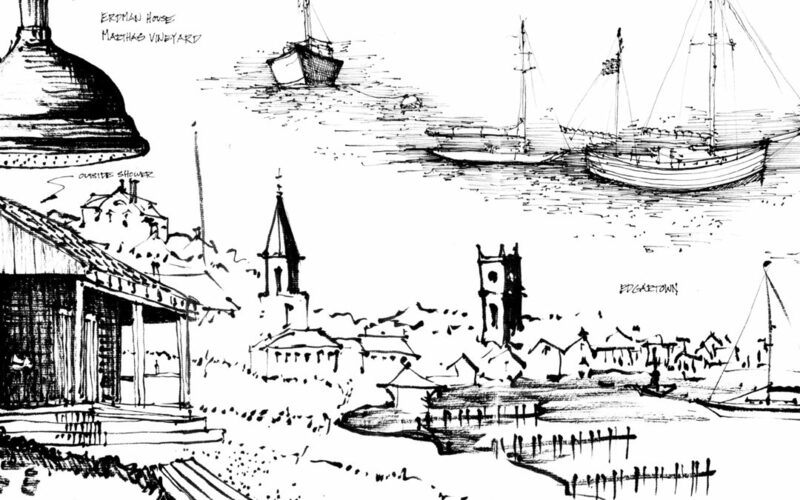 This sketch also shows a few boats as well as a roofline of the largest town on the island, Edgartown. Like many New England towns, Edgartown is distinguished from a distance by its church towers. Churches and school and municipal buildings that play a spiritual and civic role in binding a community are typically the tallest and largest structures. Only in the last hundred years have commercial buildings and office space overtaken the height of other buildings. In Washington, DC, the federal government restricts the height of commercial buildings. Since office buildings cannot exceed the height of the US Capitol Dome, none are taller than about ten stories. In Philadelphia, the same rule was true for the statue of William Penn on top of City Hall. However, in the 1980s, a developer discovered that the law was not actually written down, so he built taller, and others soon followed. Back on the islands of Nantucket and Martha’s Vineyard, one of my favorite stories is how cobblestones arrived on the island to pave the streets. Apparently, the trading ships, used in the sixteen and seventeen hundreds for whaling, would need ballast weight to steady the empty ships. They used oval river rock stones the size of a grapefruit. Some of the ships traveling from either mainland America or England would empty their ballast prior to loading whale meat, oil, and candles. What better for the town to do with the stones than to roll them out and pave the muddy roads? Author and illustrator: Charlie Szoradi is an architect, inventor, and the CEO of Independence LED Lighting. He writes about many other topics related to towns like Edgartown through his extensive travels around the world. If you have found this posting online, it is an excerpt from Mr. Szoradi’s book Learn from Looking that served as the inspiring seed content for this drawing share resource. For additional drawings and insights on Martha’s Vineyard, Edgartown, and the neighboring island Nantucket, we hope that you enjoy exploring LearnfromLooking.com. You can search via general terms such as sustainability as well as narrower terms such as Edgartown.